The Royal Mint is a government-owned company that produces and distributes all the UK’s coins. Whether you are collecting historic coins or commemorative coins produced for specific anniversaries or events such as London 2012, knowledge of the function and history of The Royal Mint will add to your enjoyment. By the 7th century Anglo Saxon kings had established mints within their kingdoms. By the time of Aethelred “The Unready” (reigned 978-1016) there were mints in 70 towns and cities. By the end of the 13th century the minting resources of Londonwere housed within the walls of the Tower of London. The coins were struck by holding a metal blank between two engraved dies and striking the top die with a hammer, hence the name “Hammered” coins. In 1660 the restored King Charles II introduced new coin-making technology fromHollandand hammering was replaced by rolling mills and screw presses, which produced better quality coins more quickly – “Milled” coins. In 1696, Sir Isaac Newton became Warden of The Royal Mint and his first task was to address the problems of forgery; he later supervised the great recoinage of 1696. In 1699 he became Master of The Royal Mint. In 1797, Matthew Boulton won a contract to produce coins for The Royal Mint. The coins were of outstanding quality, struck using the latest steam presses. The Royal Mint decided to adopt the new technology, but the premises at theTower of London were too small. A new purpose built factory on a 4-acre site of a former Abbey on nearby Tower Hill was commissioned, equipped with the latest steam presses. These two-ton monsters were capable of striking 100 coins a minute of vastly superior quality. They provided The Royal Mint with the capacity to cope with the demands of the great recoinage of 1816. In the next four years the mint struck 40 million shillings (5 p), 17 million half crowns (12 ½ p) and 1.3 million crowns (25 p). Over the following century the products of The Royal Mint were circulated throughout the British Empire. Branch mints were opened in Sydney, Melbourne, Perth, Ottawa, Bombay and Pretoria, which together produced almost as many gold sovereigns as the Mint itself. In 1816, The Royal Mint had produced the world’s first “token” coinage – coins with a face value higher than their intrinsic worth. In 1917, The Royal Mint stopped production of gold sovereigns, replacing them with paper banknotes. In line with post-war shortages, the silver content was removed altogether in 1947, resulting in cupro-nickel “silver” coinage. The Royal Mint however continued its vigorous commercial approach to the minting and marketing of coins, seeking orders from all over the world. By the second half of the 20th century, The Royal Mint had become one of the world’s most successful coin exporters. After World War II, the next challenge facing The Royal Mint was decimalisation of the UK coinage. Although there had been previous unsuccessful attempts to decimalise our currency and bring us in line with the Continent, during the 1960s the movement gathered momentum. On 1st March 1966, the Government officially announced the changeover to decimal coinage. In 1968 the Royal Mint introduced 5p and 10p coins and in 1969 came the brand new 50p (or ten shilling) piece, designed to replace the ten-shilling banknote. “D-Day” itself came on 15th December 1971 and went off amazingly smoothly. The old penny and three-penny bit were withdrawn sooner after and the sixpence (2.5 p) followed in 1980. The £1 coin arrived in 1983, while the 5p, 10p and 50p coins were re-sized in the 1990s. The need to mint hundreds of millions of new coins, and meet the growing demand from overseas customers, meant that the Tower Hill mint was inadequate. In December 1968 the Queen opened the first phase of the new Mint production facility at Llantrisant, South Wales. The last coin, a gold sovereign, was struck at Tower Hill in November 1975. Today The Royal Mint is one of the world’s foremost producers of coins and medals, renowned for its quality, creativity and integrity. At its state-of-the-art purpose-built plant at Llantrisant, the Mint produces 90 million coins and blanks a week – almost five billion coins a year. It supplies all theUK’s circulating legal tender coins circulating and is the world’s largest exporter of coins. The Royal Mint employs more than 900 people and operates round-the-clock for 52 weeks a year. 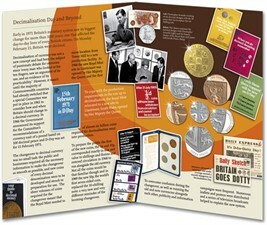 The Royal Mint also meets the needs of a growing number of collectors, in Britain and abroad. People have always collected the products of the Mint, of course, but over the past 50 years the Mint has made great efforts to meet the needs of collectors. In 1957 the Royal Mint resumed production of sovereigns and in 1979 struck proof sovereigns, still popular today. The Mint issued a commemorative crown (25p) for the Coronation in 1953 and for Winston Churchill in 1965. Since then Royal Mint commemorative coins, usually crowns, have become eagerly awaited by collectors. London 2012 and the Queen’s Diamond Jubilee have given collectors a huge opportunity to own in 2012 and a chance for The Royal Mint to showcase its product range. The Royal Mint has also been honoured with the task of producing the medals to be awarded at London 2012.